"Are you talking yourself INTO what you want to do - or OUT OF it?" - Sam Horn How satisfying it was to cross the finish line of the Bolder Boulder 10K. I still can't believe I almost took myself out of the running ... before it even started. The BB is one of the largest 10K races (6.2 miles) in the country with 50,000 participants. I planned to be in the area visiting my son Tom, and thought it’d be a fun event to do together. It would give us something to train for and look forward to. A memory in the making. This is no ordinary race. It’s got water slides, a singing Elvis, a Macarena dance-along, costumes, parents with babies in backpacks, shuffling dinosaurs, all with the stunning Colorado mountains as a backdrop. Unfortunately, in the days leading to the race, the wimp inside me started speaking up. Who was this unwelcome voice, this nay-sayer, taking pot shots at my dream? Growing up, I had promised myself I wouldn’t become a grump, grousing about my age and aches and pains, taking myself out of the game of life. Yet here I was doing what I had promised myself I wouldn’t. I had organized running programs in Washington DC when I was in my twenties. We would take people who hadn’t run before, and with the support of our enjoyable group jogs around the monuments and Smithsonian, they could finish a 10K after six weeks of training. Yet here I was, worrying whether I could finish six miles … walking. Embarrassing. 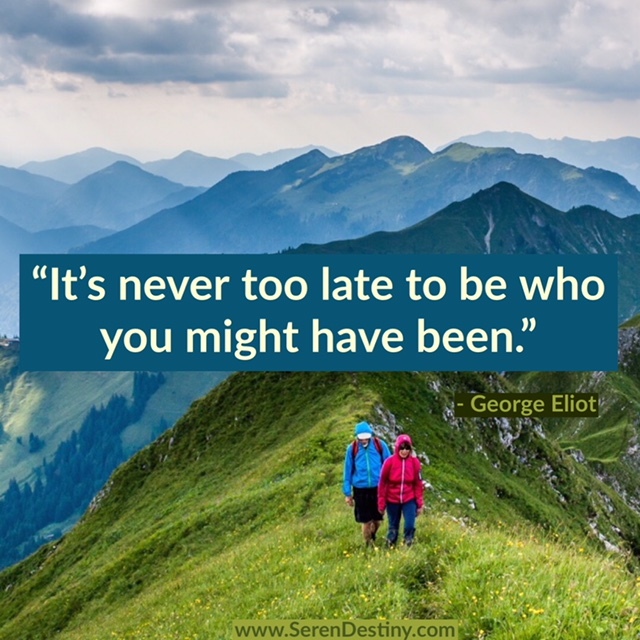 It’s also never too late to be who we want to be. I told those doubts to get lost and started focusing on what a one-of-a-kind OPPORTUNITY this was. I reminded myself how glad I would always be I went ahead and did this instead of backing out. I realized Tom and Patty could go at their pace, I could go at mine. That removed pressure. I told myself that if I needed to drop out, I could; but I would make that decision DURING the race, not BEFORE. The night before, Tom opened our race packet, got out our t-shirts, pinned our numbers to the front, and researched the event online. After seeing all the closed streets, he wisely ordered an Uber so we could zip into town the next morning with no problems. Doing the actual prep made it all easy peasy. Memorial Day dawned bright and sunny. A perfect day. The excitement and sheer fun of being surrounded by people making the most of their health and life was inspiring. My comfortable pace allowed me to genuinely enjoy and imprint every step of this memorable experience. I wasn’t fast, but I finished ahead of the dinosaur. Only in the Bolder Boulder can you say that. Those words “I did it. I did it” are a fountain of confidence. Every time we step up and do something that is in alignment with who we want to be, we like ourselves and our life a little bit more. Every time we back out of something we want to do, we chip away at our confidence. We think less of ourselves when we pass up opportunities that would make the most of our life. What is your version of the Bolder Boulder? What is something you want to do - have been thinking about going for - but those nay-saying doubts are creeping in? Whether it's going for a promotion, getting involved in Toastmasters, applying for a job, or saying yes to speaking at a conference - you will never regret putting yourself into the game of life; you will only regret taking yourself out of it and wondering what might have been. Ask yourself, “Am I going to be a spectator or a participant?" Which feels better? Which will you always be glad you did? You will never regret saying yes to life; you will only regret saying no and missing out on the satisfying, confidence-building opportunities and experiences that could be yours. I'm speaking from experience. It's never too let to be who you want to be.